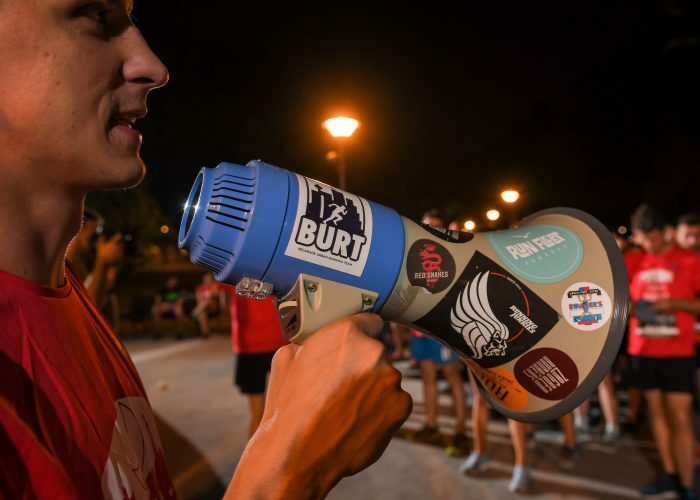 We organized the Belgrade midnight run (BMR) in 2016 and 2017. It is a race that starts exactly at midnight, where the route is all up to runner. We set up 10 checkpoints around the city, and each runner is given a different combination of four numbers, each number is one of the checkpoints, that he had to visit and collect a bracelet as proof. Envelopes with exact locations of the checkpoints were distributed to runners at the start of the race at midnight. They had to think fast and run even faster. Depending on how well the runners know the city and how pragmatic and clever they are, the routes could vary from 15–20km. There were more than 200 runners that were crossing paths while running the streets wearing the same t-shirts, in different parts of the city.